he following is an adaptation of a talk I gave recently on the CSDA understanding of the Mark of The Beast. I have attempted to make it as short as possible, while at the same time capturing the important elements that have shaped our understanding. The primary focus of this article is to explain the difference that we have with mainstream Adventism regarding what this final mark truly is. 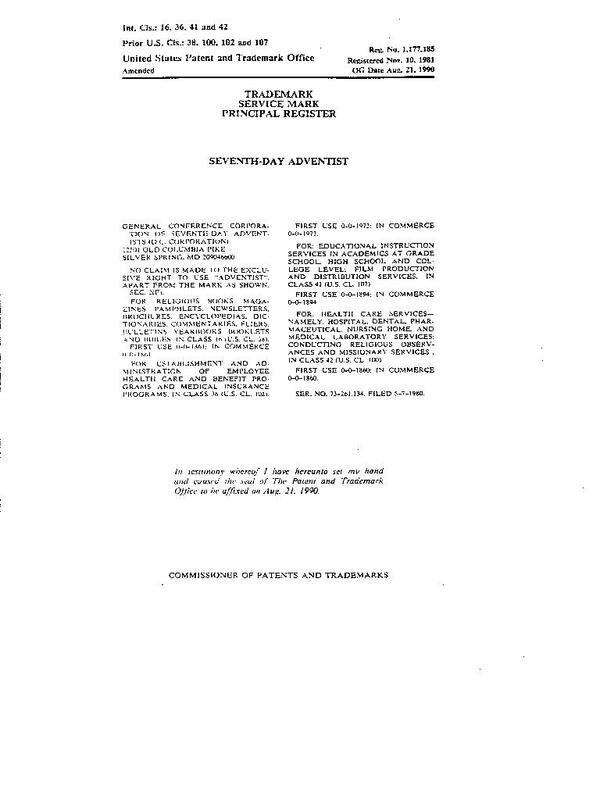 Most Adventist groups believe that the Mark of The Beast will consist of a law created at the request of an apostate Church in combination with civil government. In this, they are correct, however they claim that this will have the specific form of a “Sunday Law.” This law, traditional wisdom declares, will force human beings to choose between obedience to the true, Biblical Sabbath, and the Sabbath of the papacy: Sunday. For this belief, Adventists have much support from the writings of Ellen White. So conclusive does this evidence appear to be on the surface, in fact, that those who dispute it are considered to be infidels from Adventism, and to disbelieve the inspiration of one whom we all consider to be a latter-day prophet. It is not, however, the case that a belief in the validity of Ellen White’s writings necessarily leads to an acceptance of the way in which she believed certain prophecies would be fulfilled. While this may seem like a strange concept at first, the Bible actually contains strong precedent for this idea, and we will examine this key concept before moving on to anything else. The Bible gives us these instructions when testing the claims of a prophet: “When a prophet speaketh in the name of Yahweh, if the thing follow not, nor come to pass, that is the thing which Yahweh hath not spoken, but the prophet hath spoken it presumptuously: thou shalt not be afraid of him.” (Deu 18:22) This seems clear enough. And there is further instruction, because not every prophet that seems to give an accurate prediction is necessarily sent by Heaven either. Clearly, the reason why Yahweh did not do what He had declared was because the people repented. They accepted the guilt of their current condition, and the put away their idols and wickedness. History records a time when the people of Nineveh became monotheistic practically overnight, and the secular world does not have any explanation as to why this should be… yet the record of it is preserved for us in Sacred Writ. This is not the only example of conditional prophecy in the Bible. Ezekiel, another confirmed prophet of Yahweh says this of Israel: “Thus saith Adonai Yahweh, ‘In the day that I shall have cleansed you from all your iniquities I will also cause you to dwell in the cities, and the wastes shall be builded. […] Son of man, set thy face against Gog, the land of Magog, the chief prince of Meshech and Tubal, and prophesy against him, […] In that day when my people of Israel dwelleth safely, shalt thou not know it? And thou shalt come from thy place out of the north parts, thou, and many people with thee, all of them riding upon horses, a great company, and a mighty army; and thou shalt come up against my people of Israel, as a cloud to cover the land; it shall be in the latter days, and I will bring thee against my land, that the heathen may know me, when I shall be sanctified in thee, O Gog, before their eyes. Clearly, there was never a time when Israel was cleansed from all its iniquities, nor a time when Israel dwelled safely after this prophecy was given. Some have said, therefore, that this will happen some time in the future, and to an extent they are correct. However, it does not happen for the actual, earthly Israel, but for the city of New Jerusalem, the home of all the Redeemed, and it happens in a setting quite different than that which was foreseen by Ezekiel. This is just a short excerpt, but the parallels are numerous and precise. The prophecy in Ezekiel is actually fulfilled at the very time of Heaven’s triumph, and even the same names are used for the enemies of the holy people: Gog and Magog. There are several other easily cited examples as well, but these two suffice to demonstrate the overall idea. The principle, therefore, is clearly this: when the course of a people change, the nature of the prophecies associated with that people must of necessity change as well. It does not make the prophet a false one; rather it confirms that the human agent is not speaking from his (or her) own wisdom, because the manner of the prediction’s fulfillment may take place in a way completely unimaginable from the current perspective. This is exactly what has happened in regard to Ellen White’s statements about a Sunday Law, and I will explain how and why this has come to pass. The next thing we must establish is the direction from which the Mark of the Beast will come. Adventists believe that a coalition of Sundaykeeping Churches, following the example of papal Rome, will attempt to make Sunday the official day of worship for Christendom. Further, they will use the courts and legislature of the United States to actually make it illegal to keep the true Sabbath holy and to work on the first day of the week. More generally, “Whenever the church has obtained secular power, she has employed it to punish dissent from her doctrines. Protestant churches that have followed in the steps of Rome by forming alliance with worldly powers have manifested a similar desire to restrict liberty of conscience.” [The Great Controversy, p. 443] These are but two quotes, but they give the general tenor: the Church which forms the image to the beast, thus enforcing the Mark, must once have had the truth, and it then in the last days turns and, because of apostasy from that truth, seeks the aid of civil government to enforce its will. In these last days, there is only one Church remaining that is “current” in terms of the reformation process, the Seventh-day Adventist Church. Yet prophecy declares that it will not be this Church itself that endures to the end! In fact, it will be a Church that comes out of this denomination that will constitute the famed 144,000 who endure the time of trouble. All previous stages of reform will have come short, and turned to the world for help, thus sealing its own doom. How can we be sure of this? The Bible tells us, and in the very words of Christ. We read, “For the Kingdom of Heaven is like unto a man that is an householder, which went out early in the morning to hire labourers into his vineyard. And when he had agreed with the labourers for a penny a day, he sent them into his vineyard. And he went out about the third hour, and saw others standing idle in the marketplace, and said unto them, ‘Go ye also into the vineyard, and whatsoever is right I will give you.’ And they went their way. This is clearly a reference to the Matthew 20 parable, since it deals with the vineyard, equal pay, and those who are “called into” the service of tending to the people Yahweh summons to His kingdom. And we note that in order for a new set of workers to be called, it means (in this application) that the previous workers have ceased. Now, the individuals themselves who labored faithfully will be worthy of their reward in the judgment, to be sure… but it is clear that the system to which they belonged only endured for a time. Paul, for example, said, “And so all Israel shall be saved,” (Romans 11:26) referring to the individuals, all the while helping people to come out from the system of earthly Judaism. The apostles made a distinction between the people and the religious tradition (as must we) therefore we can at once love the individual while denouncing the falsehoods to which he or she may cling. So then, if the Jewish Church came first, but fell when they crucified Christ, we find the next workers to be called, at the third hour, were the apostles themselves. But, as early Church history tells us, their organization also united with the first beast (Rome) and became the Roman Catholic Church. At that point, the Reformation churches sprang forward to take up the mantle, and moved prophecy forward. We note that in each of these ages, precious promises were given to the Church. Yet, at every fall, the conditions for these predictions were not met, and so the promises passed on to the successors. The Reformation Churches came over to the new world, but even they did not endure to the end. No, they joined themselves to the second beast, and formed a union which persecuted those who were coming to an understanding of the validity of the Sabbath commandment. Books such as The American State Papers Bearing on Sunday Legislation outline the persecution suffered by Sabbathkeepers in the 1800s at the hands of those who wanted to preserve the United States as “a Christian country.” But Christ is not honored when the tools of His enemy are employed (nominally) in His service! But if the parable is to be fulfilled to the letter, we find that indeed there is one more calling-out to go. How can this be? Does the Seventh-day Adventist Church join to the world? How can it do so, when it has been warned so often about falling in this manner? And what will this do (based on the principle of conditional prophecy) to the “Sunday Law” Adventism is expecting? We will discover this as we fill out the table completely. But as we do this, let the reader take note that although both the Jewish and Apostolic Churches joined to “Rome,” there was a difference in the nature of the state to which they wed themselves. The first Rome, to which the Jews bowed the knee, was pagan in nature. When the Apostolic Church joined to Rome, it was taking on a religious character more in line (outwardly) with Christianity. In fact, this union produced the papacy, and the Roman Catholic Church. If there is to be an “image” to this first beast’s activities in the New World, we would expect to see a similar kind of operation happening in the United States government. Indeed we do, and it shows exactly why the Mark of the Beast has to do with the Sabbath (all Adventists are correct about that part), but not with a literal “Sunday.” This is the part that was subject to condition, and changed due to recent events. It is obvious from a reading of Daniel that the only “weeks” that could possibly be meant are those found in Daniel 9:25-27, and reveals without room for controversy that this prediction was understood to be the Savior Himself. It also provides yet another witness testifying to the validity that in prophecy, a day represents a year, a staple teaching of Adventism based on what the Bible reveals. So then we read that Christ ended the Sacrificial ordinances, but there is no mention anywhere of a change in the laws, except that the first beast would “think” or “attempt” to do so as recorded in Daniel 7:25, which is precisely what Rome did in regard to the Sabbath. From man’s standpoint, however, the Sunday is “another” Sabbath. It may not be valid, but it IS so labeled by the Catholics and various other Sunday-keeping groups. It is, in their words, the new “Lord’s Day,” and as those in the United States called it while throwing true Sabbath-keepers in prison, “the Christian Sabbath.” This makes two. But there is one more. There is a third Sabbath, and it is mentioned in the Scriptures. The first Sabbath, the only one with continuing validity, is that seventh day which was blessed and instituted in Eden (Gen 2:3), being ratified on Sinai by the covenant with Israel. (Exo 20:8-11) The second is the counterfeit Sabbath produced when the enemy of Heaven attempts to change “times and laws.” (Daniel 7:25) But there is a third as well, and we read of it in the book of Hebrews. “For He spake in a certain place of the seventh day on this wise, ‘And God did rest the seventh day from all His works.’ And in this place again, ‘If they shall enter into my rest.’ Seeing therefore it remaineth that some must enter therein, and they to whom it was first preached entered not in because of unbelief: Again, he limiteth a certain day, saying in David, ‘To day, after so long a time; as it is said, To day if ye will hear his voice, harden not your hearts.’ For if Jesus had given them rest, then would he not afterward have spoken of another day. There remaineth therefore a rest [literally, a “Sabbath-keeping”] to the people of God. Remember, this letter was addressed to the Hebrews, and it speaks of “another” Sabbath that has to do with a spiritual rest to which the physical rest only pointed. Why would this epistle tell those who were already keeping the 7th day holy that there remained yet “another” day into which they were to enter? The answer becomes clear when Paul explains in that second paragraph above. To enter into true “Sabbath” means to cease from your own works. It does not mean one stays at home and does nothing, for the Bible also tells us, “if any would not work, neither should he eat.” (2 Timothy 3:10) This is a quietness of heart, a peace in the soul, and the true Sabbath about which the seventh (literal) day was to instruct us. This does not, of course, do away with the importance of the literal day! Christ taught that to be angry with your brother made one guilty of murder in the spiritual sense, (Matthew 5:21, 22) but physical murder is still a sin. So it is with every other commandment for, likewise, one may keep the letter of the Sabbath, but still be guilty of violating it if there is no peace, no rest in the protection of Christ and Christ alone. To employ the spirit of the papacy to enforce one’s beliefs, even if it is about so serious a matter as the commandments of God, is like going to Egypt for horses, to rely on the arm of flesh and strengthen one’s ties to an earthly kingdom. (Deu 17:16, 2Ch 32:8, John 18:36) These things were forbidden by the Scriptures, and certainly have no place in the religion of Christ. If the Seventh-day Adventist Church, to return to our topic, has gone to the world, to the very second beast of Revelation, to protect itself, to preserve even what they believe are “pure doctrines” from corruption and confusion, they have failed to enter into the rest Christ has provided, and like the Pharisees who nailed the Messiah to the Cross, they are recorded in the books of Heaven as those who have violated the sacred blessing of the Sabbath. Have they done this? Yes, they have. The triumph of “Rome” in the New World? This is an image to that first beast! And if it is “once” done, as it has been in 1981, then the image has indeed been formed… and the second beast does indeed give worship to the first. The parallels are far too clear to be ignored. To take the last question first, we cannot simply change the name we believe God gave us. He has given us no instruction that we are to take another name, and every instruction that we are to preserve the name “Seventh-day Adventist” regardless of circumstances. Now, and again, much of this had to do with the 7th day Sabbath, yet if the spirit of the Sabbath be violated by a people, not only will the specifics of those prophecies associated with those people be altered in its fulfillment, but they will be found guilty of sin just as surely as the man who never slays his neighbor, but hates him in his heart. The name Seventh Day Adventist tells the world who we are; it is a banner of testimony, the keeping of which we are given no permission to alter. Is it idolatry to keep the name even if the law tells us not to? No indeed! We would be bowing to the validity of the state in controlling our religious convictions, and that would be idolatry. 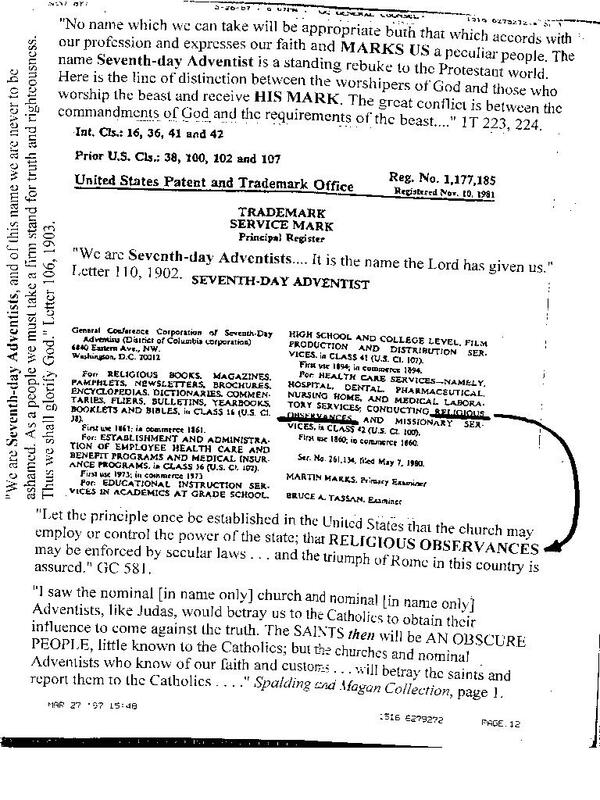 Regarding the first part of that question, that the Mark of the Beast is supposed to be a Sunday Law, it should already be apparent that if Seventh-day Adventists, who were to be the great heralds of the Sabbath truth fell, then there will be many who would not bow to a Sunday Law, yet who were not truly keeping the Sabbath in spirit and in truth. A Sunday Law of itself, then, would not test the Churches. Furthermore, this is a little-known fact in Adventism, but the first edition of The Great Controversy, in which Ellen White recorded what she actually saw of the last days, did not contain the word “Sunday” at all! Understanding the three Sabbaths, and seeing how prophecy changes in relation to the course of the recipient people, it should easily be seen that the Trademark Law is an “exact equivalent” of the Sunday Law which, after the fall of Conference Adventism, would no longer be apt to test the hearts of Christians. Furthermore, Ellen White wrote that she wrote what she did of Sunday in response to “the very time in which we live,” [Evangelism, page 233] that is, the 1800s in which a Sunday Law (the Blair Sunday Rest Bill) was indeed imminent. Again, she wrote, “The Sunday law issue, now becoming prominent because of the Blair Sunday bill was discussed.” [The Lonely Years Volume 3: 1876-1891, page 376] Let the reader note carefully the year in which she said the Sunday Law was “now” prominent. These are issues about which Adventists have not studied as deeply as they should. A careful reading will reveal plainly that Ellen White expected that very law to either pass, or see a rapid resurgence, and thus overspread the earth. We note that there is a parallel. The first union between Protestantism was about the “letter” of the Sabbath, the Sunday itself. Similarly, the Jews joined themselves to the Roman government for civil/political considerations. (John 18:14) It was to “keep the peace” in their religious institution. Similarly, this second union between a Protestant body and the U.S. civil powers is about the “spirit” of a law, just as the union of the Apostolic Church with Pagan Rome produced the papacy, a spiritual “head” of a world power. “A union of church and state means a recognition of a spurious sabbath, and a failure to respect the conscientious observance of the Sabbath of the fourth commandment.” [Manuscript Releases Volume Twelve, page 218] Again, we should be clear that Ellen White DID believe in a Sunday Law’s approach, just as surely as Jonah warned the Ninevites of impending doom. The principle, however, is sound in either case, and just as valid today as it was in the days of Ezekiel’s prophecy regarding Gog and Magog. The course of the people having changed, the predictions are fulfilled in a spiritual, rather than physical, manner. Other Adventists have written on this matter of the true, spiritual Sabbath as well: “I need not undertake to give a definition in detail of what the image of the beast is; we all know well that it is the church power using the government, the civil power, for church purposes . . . And of all Christians, Seventh-day Adventists cannot do it. The very keeping of the Sabbath forbids it.” [General Conference Bulletin, page 28, 1895 – emphases mine] This also appears in the 1896 First Quarter Sabbath School lesson, so it is not an unknown principle by any means. Similarly, it began in the United States, and will spread over all the world, for U.S. 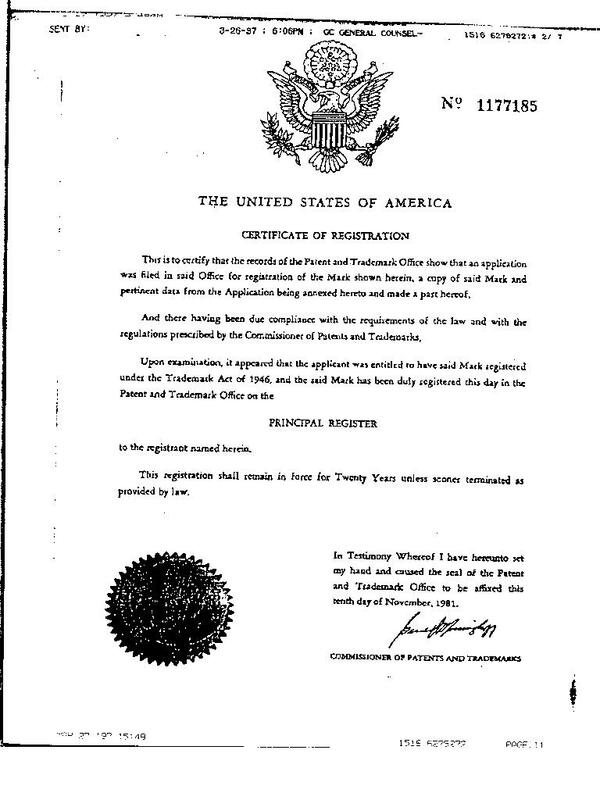 Trademark patents are indeed globally accepted. It is a mark without which Adventists may neither “buy” or “sell” (i.e., trade) in Gospel literature or studies, and it is verily an attempt to control religious observances by means of human might. The Bible and Ellen White have a great deal to say about such an evil. The quotations from Ellen White and other Adventist writers are truly too numerous to mention in an article of reasonable length, but the idea should be well apparent, and the apostasy of the General Conference in their actions related to this matter should be open for all to see. Let the man and woman with spiritual eyes marvel at the darkness which has crept over the minds of those who now say, “We are the true people! Come out from all those other Church/state unions and into the true Bride.” But of all the people whom the Messiah rebuked when He was on earth, He had the least patience of all for the hypocrites. This is the very language of Revelation 18, in which the final calling-out is described! There can be no mistake, therefore that this took place, and that there is one last set of workers in the Vineyard at the eleventh hour: the 144,000, the Creation Seventh Day Adventist Church. The course of Seventh-day Adventism has changed in a most startling manner, yet the people remain largely uneducated as to what their leaders have done to them. Yet, there is a true Church left on the earth, and she is a Virgin, for she has never known the union with the world, but waits for her Husband from on High. There are a people who “follow the Lamb whithersoever He goeth,” (Rev 14:4) who understand what conditional prophecy is, who know when a religious body has fallen under the power of Satan, and who would rather die than violate a commandment of our Creator in either the letter or the spirit.